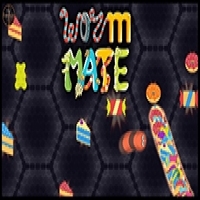 Wormate is basically a Slither styled game with a twist, this game features cool power ups, a lot more customisation and awesome food graphics that make them look extra tasty even to the pickiest of worms. Game directions: In the world of Wormate your main goal is to become the biggest worm around, to do this you must eat the passively spawning food around the map of kill the other worms and eat their mass. To kill an enemy world simply make their head crash into your body, just remember that anyone can eat the food dropped so eat up fast! This feature works both ways however, if you see two bigger worms battling it out just remember that you can come along and snag some of their mass for your own worm. Early on it is recommended not to try to fight other worms as you don’t have a big enough body to really catch anyone off guard, however its not a bad idea to try and salvage some food off dead worms. Controls Within game your worm will follow your mouse cursor, this will only control the direction the worm heads however, you can not stop your worm. You can also left click to boost your worms speed for as long as you hold it, but remember that this ability slowly depletes some of your existing score.